Common interfaces are used at all index types to provide high-level abstraction for functionality that has to work with any type of search index (e.g. datagrids). oro_search.prepare_result_item – after the extraction of documents from search index, used to populate additional information (entity objects, URLs etc). Standard index type performs indexation on an entity level – i.e. indexation process is triggered for each entity. Search field values can be calculated automatically based on the defined search mapping. Each search document contains one all-text field value calculated automatically as a concatenation of all text entity field values. Each field might have several values. In this case, it will be represented as an array, and comparison operations will iterate over all of them. During reindexation the entities that are being reindexed are not available for search. Website index type (sometimes referred as frontend index type) is used only at the OroCommerce application – this application uses standard index type at backend part, and website index type at frontent part of the application. Each entity is represented by one alias with optional search placeholder (e.g. oro_product_WEBSITE_IT), so in fact each website might have its own entity alias (e.g. oro_product_1 and oro_product_2). Entity fields might contain search placeholders as well (e.g. name_LOCALIZATION_ID), so in fact each field might have several values depending on the provided placeholders (e.g. name_1, name_2 and name_3). Website index type performs reindexation on an entity batch level – i.e. indexation process is triggered for batch of entities (default batch size is 100). Search field values have to be calculated and set manually at a listener to oro_website_search.event.index_entity event. Each search document contains all-text fields for each available localization (all_text_LOCALIZATION_ID) and one all-text field that includes values from all localizations, values are calculated automatically based on a flag set during the indexation (i.e. developer may specify what exact values should be in all-text field value). Each field without placeholder must have ony one value. During reindexation, entities that are being reindexed are available with the old (outdated) data. Elasticsearch search engine allows to store big amount of data and perform fast search queries. Performance of Elasticsearch engine is quite good and it is recommended for bigger applications, with hundereds of thousands and millions of entities. The Elasticsearch feature is only available in the Enterprise edition. Elasticsearch search engine requires credentials to connect to actual index. Credentials include optional WWW-auth parameters and SSH connection support. Elasticsearch search engine for standard index type is implemented in OroElasticSearchBundle in the platform-enterprise package, for website index type it is implemented in OroWebsiteElasticSearchBundle in the commerce-enterprise package. Current implementation supports only Elasticsearch 2. * versions. 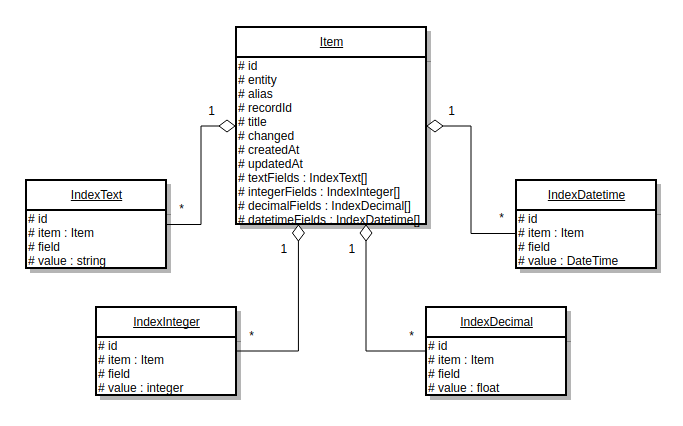 Each of the supported index types uses its own set of entities – i.e. 5 entities for standard index type and 5 more entities for website index type. 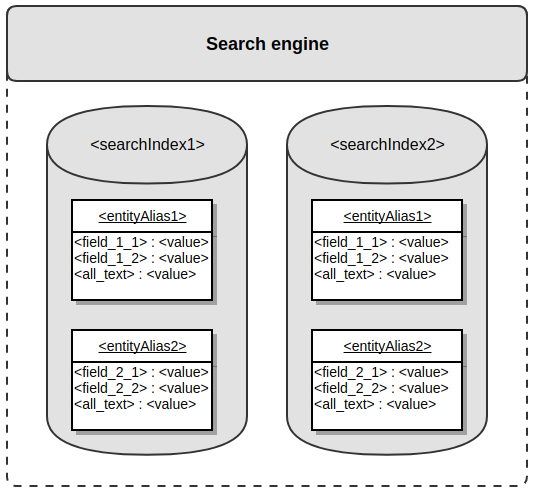 Each of the supported index types uses its own Elasticsearch index. String representation is pretty similar to standard SQL query – this string may contain keywords select, from, where, aggregate, order_by, offset and max_results. String represenation is used mostly at the API where user can request specific data with specific condition. During the processing of string representation it is converted to object representation. Website search index type provides an event called oro_website_search.reindexation_request to manually trigger reindexation process for the specified scope of entities. It uses event class Oro\Bundle\WebsiteSearchBundle\Event\ReindexationRequestEvent which accepts boolean parameter $scheduled to specify whether indexation has to be asynchronous (default behaviour) or synchronous. Here are examples of a triggering of this event. ORM search engine uses DBMS as a main storage and its scalability depends on scalability of DBMS. For example, PostgreSQL supports several clustering solutions, so ORM search index can be scaled together with the main relational DB. There is one more trick that can be used. As long as ORM search engine uses its own connection and its own entity manager, all search related tables can be moved to a separate DB at the remote server. In this case application administrator has to override configuration for connection called search and refer to this remote server. ORM search engine uses DBMS as a main storage and ability to handle unavilable state of a storage depends on how it is organized at the used DBMS. Both MySQL and PostgreSQL support repliacation, which can be used to manage such situation. If you have search index at the separate DB then you can organize replication exclusively for this DB. Loggin is an essential part of any conponent, and search component is not an exception. Both standard and website search indexes in dev mode log all requests to search index storages (DB or Elasticsearch); in prod mode only exceptions are logged. In case of prod mode all exceptions are also sent to an emails specified in system configurations at System Configuration > General setup > Application settings > Error logs notification section. Standard search index also may log all search queries to database table oro_search_query (entity name is Oro\Bundle\SearchBundle\Entity\Query), by default this logging is turned off. Elasticsearch engine impelementations uses their own Monolog logger channels – oro_elastic_search for standard index type and oro_website_elastic_search for website index type. Autocomplete form types by default use standard search index type to find entities and show them to user (see Oro\Bundle\FormBundle\Autocomplete\SearchHandler). They don’t use niether string, nor object query representation directly – instead it uses the indexer from the standard search index, which uses low-level query object inside. Use language optimization – if you know what languages are used at your application then you can optimize index structure and data according to these languages; see list of Elasticsearch language analyzers. Increase RAM – the recommended amount of RAM for search index is a half of index size or more, i.e. if you have 50GB of index data, it is recommended to have 25GB+ of RAM.